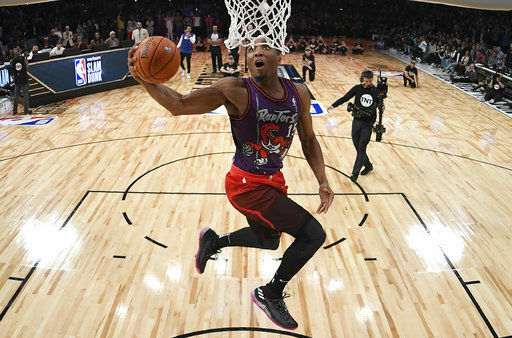 Before making his winning dunk, Mitchell peeled off his Jazz jersey and wore a vintage Carter jersey from the Toronto Raptors. Mitchell — three inches shorter than the 6-foot-6 Carter — needed a score of 47 to beat Nance, and he got a 48 from the five judges: DJ Khaled, Mark Wahlberg, Chris Rock and Hall of Famers Julius Erving and Lisa Leslie. Nance, who was trying to win the contest 34 years after his father won it, had earned a perfect 50 with a dunk off a double alley-oop off the glass. Mitchell advanced to the finals with a creative dunk in the first round that used his sister, Jordan, as well as Kevin Hart and the comedian’s son as props. For that dunk, Mitchell wore a Darrell Griffith Jazz jersey. Griffith participated in the first slam dunk contest in 1984. Each player shot five five-ball racks with a one-minute time limit. The final ball of each one was a “money ball” worth two points, and one of the racks, usually the last one, was all money balls. Booker made the money ball shot on his first four racks, and then made four of the five balls on the money ball rack. Booker, the 21-year-old sharpshooter in his third season with Phoenix, is averaging 24.2 points per game this season as the NBA’s 12th-leading scorer. Eleven months after the shooting guard dropped 70 points against Boston to become the youngest player in NBA history to score even 60 in a game, Booker added another accolade to his promising career with the 3-Point title. Silver said at his annual state of the NBA address that he didn’t know much about Saturday’s meeting but had seen a joint statement. “I was pleased to see they focused on themes of respect and empathy,” he said. “It’s a great statement about the league that these stakeholders think it’s important enough and they have an obligation to the game that they should be sitting down and talking to each other. Among the items listed in the joint between the players association and referees association were “enhanced education and clarification around the Respect for the Game rules” and plans for a “broad review” of existing rules and developing joint recommendations to enhance them. The sides said there will be future meetings and discussions. Detroit Pistons center Andre Drummond isn’t a fan of the NBA All-Star Game selection process. Drummond, who made it as an injury replacement for Washington Wizards guard John Wall, didn’t hold back when he was asked at media day Saturday why he wasn’t picked earlier. “I wouldn’t say it bothered me. It was more like I wasn’t even surprised because everyone knows how the NBA is. It’s all about politics and popularity votes,” Drummond said. “It is what it is, but for me I know I worked hard to get to be an All-Star. But that’s the way it works”. The Cleveland Cavaliers All-Star reiterated his determination to speak out on social issues and the nation’s political climate Saturday during media availability for the NBA All-Star Game. James says he “will definitely not shut up and dribble” because he realizes the weight that his words carry in the face of injustice. He’ll try to follow in the footsteps of his father, who won the NBA’s first slam dunk title in 1984. Just a few minutes after Paul George sat down at his podium for NBA All-Star Media Day, a robust chant of “We want Paul! We want Paul!” broke out among the fans sitting in bleachers in the back of the convention hall. “It feels good to be welcome. I think anybody would want to be wanted and be welcomed,” he said. The fans, of course, want George to play with the Lakers. He said he’s happy with the Thunder, but with free agency looming, coming to Los Angeles is a big possibility. The NBA’s best players have arrived in Hollywood for a star-studded All-Star weekend. None of those stars currently play for the hometown Lakers or Clippers, and that dearth will be discussed when basketball’s best get together Saturday for practice. The All-Star game also has a big new wrinkle this season: Captains Stephen Curry and James picked their own teams. That draft wasn’t televised, and some stars could have a few good-natured questions about the process. 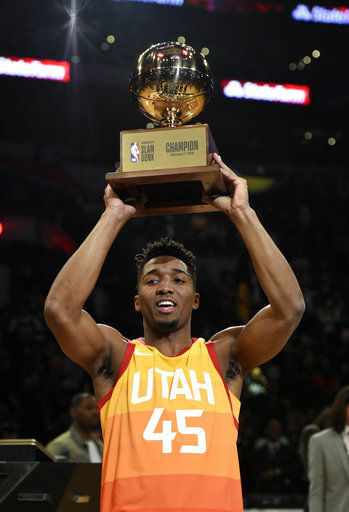 A few hours later Klay Thompson gets warmed up for the three-point competition and Utah rookie Donovan Mitchell sets his sights on the dunk contest.